You are here: Home › Blogs › Community › LibrePlanet Day 2: no software freedom? That's incompossible! 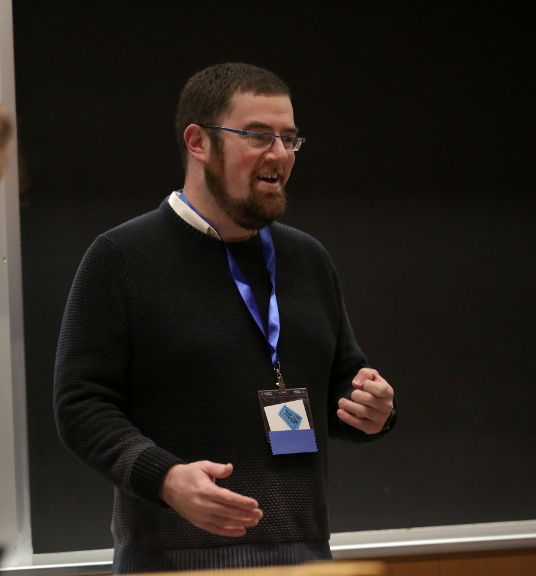 The second day of LibrePlanet 2018 began on a contemplative note with Seth Schoen's keynote speech, "Incompossibilities: Ubiquitous Engineering Tradeoffs." No, that's not a typo: "incompossible" describes multiple things that can't exist at once -- conditions in which it's impossible to satisfy every requirement. Schoen, who is a Senior Staff Technologist at the Electronic Frontier Foundation, explored the impossibility of creating absolutely perfect software, discussing how the inherent tradeoffs in software development echo those in political science, ethical philosophy, and more. Other morning sessions included a roundup of device and personal privacy technology; a workshop on free software desktops for kids; a talk on the progress the free software community has made on diversity (and how we still have a way to go); a talk about the necessity of ethical standards in the free software world; and more. Sunday afternoon, attendees gave a series of five-minute lightning talks, which provide attendees with an opportunity to give a speedy presentation on their work and their ideas. Topics ranged from Visual Bash and TechnoRubble to the metaphorical relationship between biking and free software. Projects shared included a role-playing game developed with Python and Sphinx, the Autocrypt "end-to-end encrypted email for humans" project, and the upcoming EduCode conference in Brussels, Belgium, which aspires to train teachers and school administrators to use and build free software. These talks gave a fun glimpse into the knowledge and creativity shared by the free software community -- the scheduled conference talks only scratch the surface of all of the fascinating work that our supporters do every day! The afternoon workshops also were highly community-oriented: Micky Metts and Chris Thompson, members of Agaric, a worker-owned technology cooperative, introduced attendees to methods that can engage schools and broader communities in the cooperative creation and maintenance of beneficial free software platforms and tools. In the next workshop, Walter Bender and Devin Ulibarri put the spotlight on kids, helping the audience enjoy a hands-on lesson in fun, musical coding with their program, Music Blocks. Finally, FSF board member, social scientist, technologist, and activist Benjamin Mako Hill took stock of the state of the free software community and online cooperation in a closing keynote that acknowledged many of the challenges we'll have to face in the coming years -- but many of the opportunities, as well. Over 300 people participated in LibrePlanet 2018, which was powered by 56 amazing volunteers, who ensured that everything from video streaming to IRC chats went smoothly. We also gave away raffle prizes generously donated by Aeronaut Brewing, Aleph Objects, JMP, No Starch Press, and Technoethical, and we're extremely grateful to our generous sponsors, including Private Internet Access, Red Hat, Purism, StickerYou, and Savoir-faire Linux. Between Saturday and Sunday, there were sixty-one speakers and over fifty sessions. 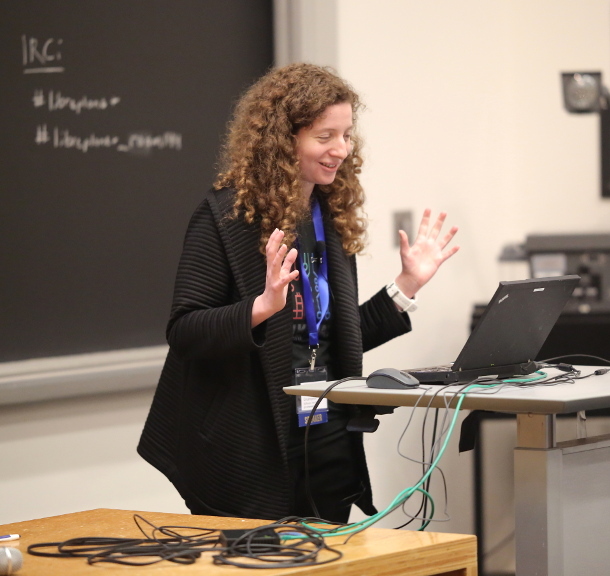 Videos will be posted soon at https://media.libreplanet.org, so keep an eye out for announcements -- whether you were here in Cambridge, watched the livestream, or missed LibrePlanet entirely, there's so much more you'll want to see! Photo credits: Pictures of Seth Schoen, attendees of the Free Software Desktops workshop, and speaker Kat Thornton, copyright © 2018 Kori Feener, photos licensed under CC-BY 4.0.